Sherlock Holmes! The very name of the world's greatest detective conjures up images of Victorian London, gaslit streets, hansom cabs, and dense fogs. But there was a time, a dark three-year period, when London had to make do without Sherlock Holmes. From 1891 to 1894, he was presumed dead, having perished during the epic struggle with that infamous Napoleon of crime, Professor Moriarty, atop the Reichenbach Falls. But unknown to most, even his friend Dr. Watson, Holmes survived. During those three years, he roamed the world, acting as an agent for the British Government and using his very special skills along the way. 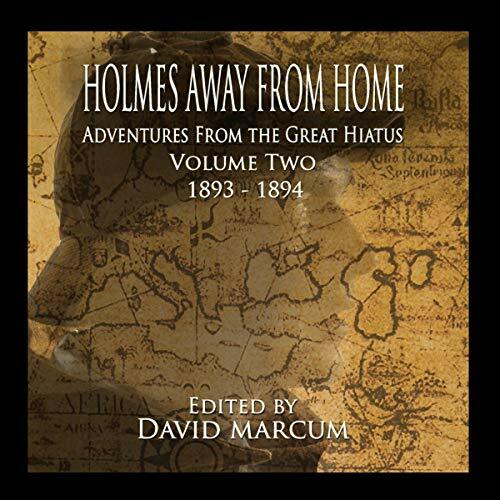 Holmes Away from Home, Volume II: 1893-1894 contains a collection of new traditional Holmes adventures, namely: "The Adventure of the Old Brownstone", "The Adventure of the Flaked Breakfast Cereal", "For Want of a Sword", "The Case of the Fragrant Blackmailer", "A Case of Juris Imprudence", "A Most Careful, Strategic, and Logical Mind", "The Aviator's Murder", "The French Affair", "The Woman Returns", "The Adventure of the Melting Man", and "The Adventure of the Empty House".